I like rattlesnakes. At least, I like them in their proper place, which is away from the house, eating ground squirrels. I’m not too fond of finding them curled up under the front porch, rattling at me in the orchard or zipping out of the grain bag when I stick a feed scoop into it. That last experience scared the baby rattler at least as much as it did me — he was gone so fast I almost didn’t realize he had run over my bare hand getting out of the bag! However, from the snakes’ point of view, they were here first (which is true) and we are the interlopers. So we have worked out a mutual accommodation over the years since we bought the ranch. It’s always a mistake to try and eradicate something entirely, whether pest, predator or prey. Use herbicides and you select for resistant plants that laugh in the face of stronger and more toxic chemicals. Introduce Canadian wolves to replace the Mexican wolf once native to Yosemite, and you have an explosion of wolves in a relatively short time. Some estimates put the current wolf pack numbers over 3,000 individuals. This was followed by major inroads on the deer and elk herds and — predictably –rancher’s cattle and sheep. The same thing applies to antibiotics, which is why we have antibiotic-resistant super-organisms. 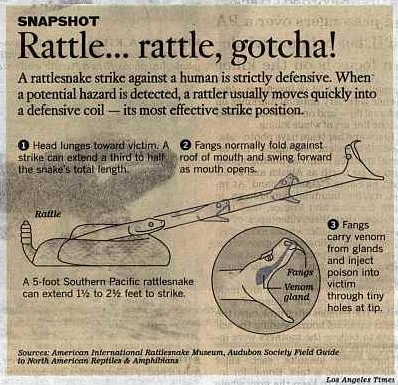 If we tried to eliminate the rattlesnakes, we’d be up to our necks in ground squirrels. What you want to do is find the balance. My primary goal is to keep the snakes away from the heavily human-traveled areas such as the houses, yards and orchards. The most effective way to do that is to keep down the rodents. Five cats outside all day, plus one hunting at night most nights, seems to do the trick. Although the cats also spend time inside, there are places where mice can get in but the cats can’t get to them because of cupboard doors and such, so I set traps whenever I spot signs. 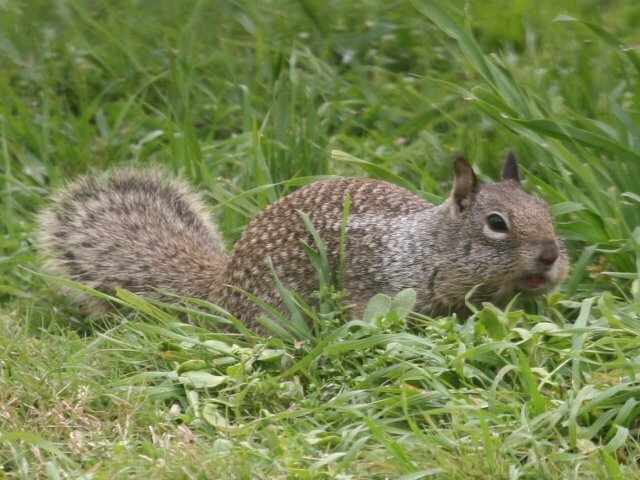 We also shoot ground squirrels, especially the ones that have the temerity to climb the apricot tree and eat the blossoms, or get into the chicken pen after the eggs. Away from the house, we do kill some ground squirrels when they get too thick, but we also leave plenty for the snakes. It’s not just rattlesnakes, of course — king snakes and bull snakes also like a mouse or squirrel now and then. Most snakes will try to get away from you if they can. We make plenty of noise when walking around, don’t reach into dark, shady places (and constantly remind the kids not to do so) and keep a close eye out during snake season. If a snake rattles or tries to get away, we simply avoid it. Our tolerance has limits, however. A snake that strikes without rattling will be killed immediately — no exceptions. We’ve only run into two of those, and luckily both missed. They don’t seem to have produced any baby snakes with that habit, thank goodness. A snake that goes on the prod without provocation also goes to snake heaven in short order. They’re more likely to do that early in the season, when they’re just out of the den and hungry after a winter’s hibernation. This entry was posted in Farms, Health and tagged chicken, ground squirrels, herbicides, ranch, rattlesnakes, snake, wolves. Bookmark the permalink.